By the looks of things outside it sure doesn’t look like spring has arrived but now is the time to start thinking about Spring Septic System Maintenance. Cleaning your Septic Filters is a good idea once everything in Delano MN begins to thaw out. Keeping the filter clean is a Cost Effective way to Prolong the life of your Septic System. It is a job that you may want to do yourself or hire a Septic Maintenance Company to do it for you. The CSI Custom Septic, Inc. Maintenance Page provides several ideas to Improve Septic System Performance and save you money. What Are Septic Tank Filter Used For? Septic Tank Filters provide an important job in protecting your Soil Absorption Drain Field from blockages. Solid materials from inside of the Septic Tank could clog up and damage the drainfield if it is allowed to leave the tank through the outlet line. Septic Filters are made to prevent anything larger than 1/8” from getting through. Some filter block out materials as small as 1/16”. The more diligent you are about Keeping Your Septic Filter Clean, the better chance you have of prolonging the life of your drainfield. 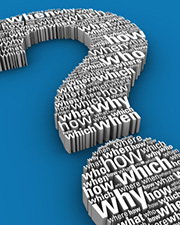 How Often Should I Clean My Septic Filter? Cleaning the Septic Filter is pretty fast and easy to do as long as you take the proper precautions. Filters should be checked for debris once or twice every year to make sure they are not clogged. It would be good to get into the habit of checking and cleaning your Septic Tank Filter each Spring when you mow the lawn for the first time and again in the Fall when you put the mower away for the season. Do It Yourself Septic Filter Cleaning 8 Step Process. Put on gloves and protective clothing. Have a garden hose and large bucket handy. Locate the septic tank filter inside of the manhole. If you have more than one manhole cover ask your septic inspector or pumper where the filter is located. Lift off the manhole cover and reach inside to grab hold of the filter’s handle and carefully slide it out of the sleeve. 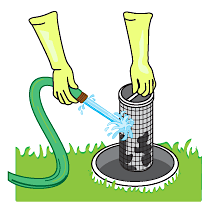 With the filter still inside of the manhole or placed inside of a large bucket, use the garden hose to spray off the septic filter until it looks clean. Slide the septic tank filter back into its protective sleeve. Place the manhole cover back into place. Wash up the bucket and protective gear with a disinfecting agent or bleach solution. For more Money Saving Tips on how to keep your septic system functioning at top performance, go to the Septic System Maintenance page for CSI Custom Septic, Inc. As a Licensed MN Septic Contractor, Custom Septic provides high quality services that are designed to Improve Septic System Performance. In Delano MN, contact Custom Septic, Inc. (CSI) at 763-218-4769 for cost effective High Quality Septic Services.